This chili is so delicious. 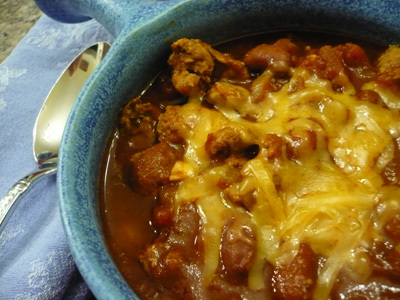 It can be made completely on the stove or once assembled it can be simmered away in the crock pot. 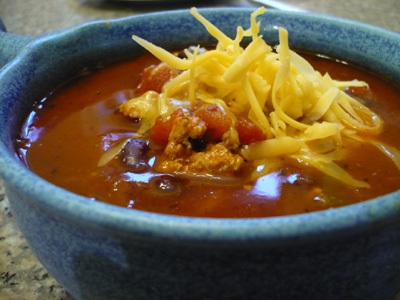 I used my crock pot, and this chili is awesome. It is thick and hearty and delicious. I used ground turkey, but you could certainly use ground chicken or beef. Sauté chopped onion in hot oil in a large Dutch oven or skillet over medium-high heat 5 minutes or until tender; add garlic, and sauté 1 minute. Add turkey, chili powder and cumin, cooking for 8 minutes or until meat crumbles and is no longer pink. Then add the tomato paste, and cook 2 minutes. Add chocolate, tomatoes, beans and water, stir to combine. Stove top recipe: Bring mixture to a boil and cover, reduce heat to low, and simmer, stirring occasionally, 30 minutes. Top with shredded cheese. Crock pot recipe: add everything to your crock pot. Cook on high for 2 hours (more time won’t hurt it) or on low for 4 hours (more time won’t hurt it). Top with shredded cheese. 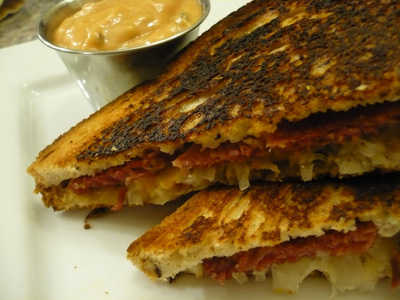 Here’s another really tasty recipe for quick Reuben sandwiches. To me what makes this sandwich is the homemade thousand islandish dressing. It’s easy, so don’t skip that step. Thousand Island Dressing: mix all ingredients together in a bowl. Sandwiches: take a slice of rye bread, add corned beef, sour kraut, swiss cheese, and some dressing. Top with rye bread. Butter the top of the bread and put the sandwich butter side down in a hot skillet. Cook until bread is browned. Add some butter to the now top of the sandwich and flip it over and cook until browned. Here’s a tasty menu for a quick weeknight dinner. 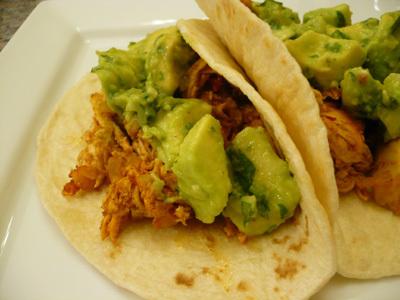 Top tacos with Mango Salsa and serve with Los Tios Mexican Rice. Combine all ingredients in a dish or zip top bag and marinate for 30 minutes. Grill until desired doneness. 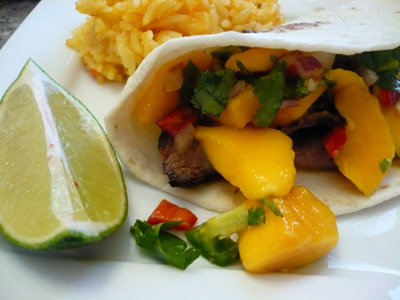 Slice steak and put in flour tortillas; top with Mango Salsa; and serve with Los Tios Mexican Rice. This chili is solid. I found the recipe and the always tasty fashionably foodie. You can cook on the stove-top or in the crock. 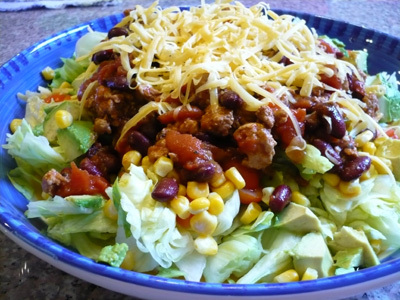 It was also really good the next day on a taco salad with creamy jalapeno dressing. In a large stockpot, cook ground beef/turkey, onion, and green pepper and/or jalapeno till meat is brown. Drain fat. Stir in undrained tomatoes, kidney beans, tomato sauce, chili powder, basil, salt, sugar, pepper, allspice and the bay leaf. Bring to a boil, reduce heat. Cover, simmer at least 45 minutes, until reduced and thickened, or cook in Crock Pot on LOW for 3-5 hours (for the crock pot, omit juice from one jar of tomatoes.) taste before serving, add a sprinkle of salt or sugar as needed. 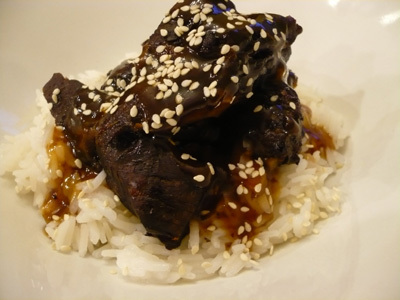 Here’s another excellent BBQ beef sandwich cooked in the crockpot. The recipe is from Taste of Home. Spray your crockpot with cooking spray. Cut the roast into quarters, and add the meat to the crock. In a bowl, combine the bbq sauce, preserves, green pepper, onion, mustard, and brown sugar; then pour mixture over roast. Cover and cook on LOW for 5 hours, or until meat is tender. Remove meat from crock and thinly slice. 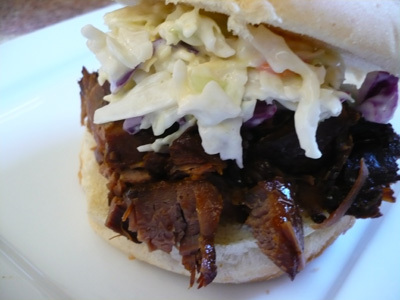 Serve on buns with slaw. Not a great picture, but are there really any good pictures of Indian curry dishes? Despite the picture, this is an excellent Indian inspired crock pot beef curry. I don’t say this often, especially with regards to a crock pot meal, but this dish is company worthy…especially if the company loves a deliciously spicy (or not if you choose not to add the spice) curry. 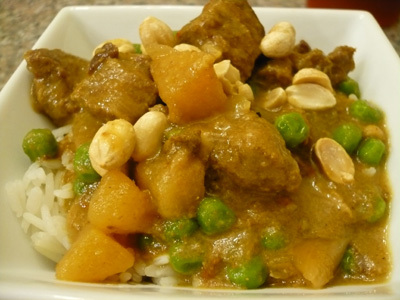 Combine coconut milk through salt in the crock pot; then add onion, potatoes, and stew meat and toss to coat. Cook on Low for 4 1/2 hours or until meat is tender. Serve over rice and garnish with peanuts and cilantro. We like chili mac. What’s not to like? 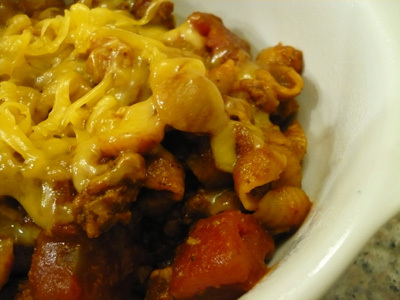 Chili with pasta and cheese. This is by far our favorite version, which comes from the Tex-Mex Cookbook. The taco seasoning mix is delicious and would be great for straight up taco meat…beef or chicken…or any recipe that calls for a taco seasoning packet. Brown meat with bell pepper, onion, and garlic in a large skillet over medium heat for 8 to 10 minutes, until meat is no longer pink; drain. Stir in tomatoes, tomato sauce, macaroni, and taco seasoning, and add 3/4 c. water; bring to a boil. Reduce the heat, cover tightly, and simmer for 15 minutes or until pasta is done to taste. Remove the pan from heat and season to taste. Top with grated cheese, and let stand for 5 minutes before serving to allow the cheese to melt. These recipes come from the October 2008 issue of Family Fun. We only had the chicken tacos, but I was so impressed with those, that we will definitely try the ground beef filling, so I’ve included the recipe here. Heat the oil in a large nonstick skillet over medium heat. Add the onion, garlic, and chili and saute until onion has softened, about 6 minutes. Add the tomato sauce, cumin and salt and cook for one more minute. Add the chicken and cook through. Taste and adjust seasoning. Heat the oil in a large nonstick skillet over medium heat. Add the onion, garlic, and chili and saute until onion has softened, about 6 minutes. Add the cumin and chili powder and cook, stirring for another minute. Add the beef and cook, stirring breaking up any lumps, until meat is cooked through. Add the tomato paste, salt and pepper; cook stirring for another 5 minutes. Taste and adjust seasoning. Admittedly not the prettiest dish out there, but it tastes so good. This recipe is from my Great Aunt Arlene Clark, and it reminds me of my youth. It’s hearty, filling and tasty. 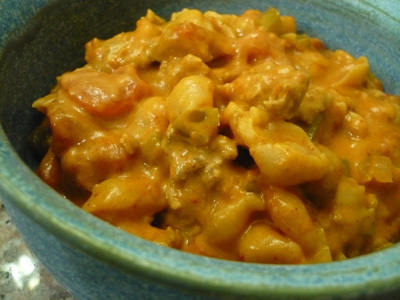 It’s kind of like a skillet casserole or a homemade hamburger helper. Brown meat in a large skillet; drain off fat. Stir in remaining ingredients, except sour cream. Heat to boiling. Cover and simmer, but stir frequently, for 35 minutes or until pasta is tender. Stir in sour cream and heat through, but do not boil.